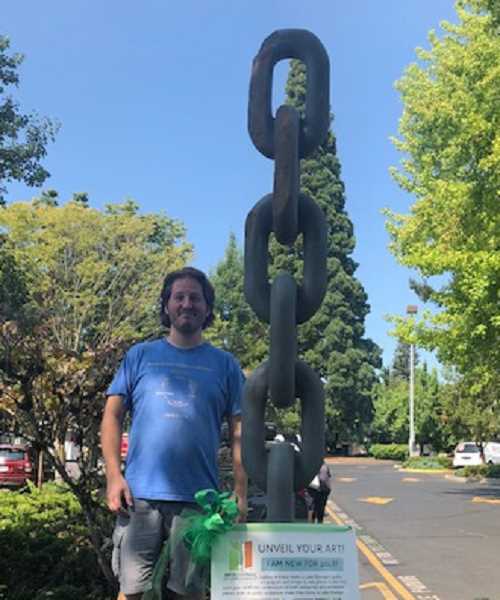 Fifteen new sculptures will officially join the Gallery Without Walls on Saturday when the Arts Council of Lake Oswego hosts its annual "Unveil Your Art!" celebration in Sundeleaf Plaza. The free event, which is scheduled from 4-7 p.m. on Aug. 25, will feature talks from artists, a drawing rally, a dedication of the new sculptures and docent-led tours. There will be food, refreshments and family-friendly activities in a Kids Corner, too. "It's exciting to celebrate what's new," says Nicole Nathan, the Arts Council's executive director. "Right in the center of the city, we're lauding creativity, artistic inspiration and visual arts education — what could be a better way to spend a summer Saturday?" Nathan says the goal in selecting new pieces for the gallery is to provide "a good mix that will appeal to a wide range of people," and Stephanie Johnson, the Arts Council's new public art and program manager, says the selection committee certainly accomplished that goal this year. "There's a lot of different materials in this year's Gallery Without Walls, and the artists come from a lot of different backgrounds," Johnson says. "A lot of them have really interesting backstories." One of those stories belongs to Wilsonville artist Benjamin C. Mefford, whose basalt sculpture "Know Time" will be unveiled Saturday at the corner of Fourth Street and A Avenue. Mefford, who grew up in Seattle, originally intended to study mechanical engineering at Portland State University and perhaps explore a love for photography. But when his cousin invited him to an Aleut cultural camp for a week, he discovered soapstone carving — and everything changed. Mefford completed his bachelor's degree in Art at Marylhurst University and then earned a master's in Interdisciplinary Studies, all the while searching for the right carving tools and the information he needed to begin a stone-carving career that would come to be influenced by an affinity for large, hard-stone sculptures and his interest in language and symbols. He experimented with symbols that were universal and yet carried multiple meaning. For example, he says, the links of a chain — like those that form his Gallery Without Walls sculpture — can have a dual nature. They can be supportive, as in a suspension bridge, or they can be a restraint, as in slavery — two concepts embodied in one symbol, separate and different and yet both true at the same time. "Know Time," which stands 8-feet-4-inches tall, took Mefford about a month to complete. It was carved from one solid piece of basalt, a stone as hard as granite and yet, because it is composed of tinier crystals or grains, much easier to crack. He'll explain that process at "Unveil Your Art!" on Saturday, as well as at a special exhibit called "Unveil Your Process" that opens with a special reception from 5-7 p.m. Friday, Aug. 24, at the Arts Council's 510 Museum and ARTspace (510 First St.). In addition to meeting the artists, visitors to "Unveil Your Process" will get a chance to see the drawings, paintings, maquettes and mini sculptures that led to the creation of the final pieces. While this is Mefford's first piece in the rotating collection, he's no stranger to the Gallery Without Walls — sculptural benches and dish rocks he created already adorn the City's new Maintenance Center on Pilkington Road. For more information about the entire gallery, go to www.artscouncillo.org or call the Arts Council at 503-675-3738.